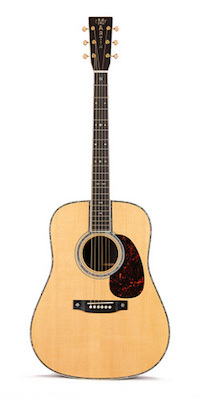 For the demanding player looking for an acoustic guitar with craftsmanship, tone and stylings of a top tier instrument, the Martin D-42 Acoustic Guitar may be the answer to your prayers. Made of the highest grade woods Martin has available and assembled by their most skilled luthiers, the D42 is built to Martin’s highest specifications. Featuring vintage inspired, hand inlaid Abalone appointments, forward-shifted “X” bracing and Style 45 Snowflake fretboard markers, the D-42 is a classically designed Martin through and through.